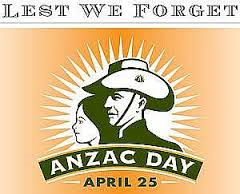 The Anzac Day public holiday falls on April 25th every year. ANZAC Day is the day of remembrance of those Australian and New Zealand Army Corps soldiers who fought and died at Gallipoli in 1915 (and all soldiers who died while fighting for their country). I hope that everyone takes a moment to reflect on the meaning of the day and the many people who will be thinking of their lost loved ones today.